You are currently browsing the category archive for the ‘supermarkets’ category. At least once a week, usually more often, I drop in at the local supermarket to stock up. I may make the trip on foot, with a two-wheeled cart limiting my load. On more ambitious days, I’ll hook up the bike trailer I purchased specifically for the purpose. It will hold a week’s provisions, but the route to the store is tricky unless I ride on the sidewalk. I would have to guess from the reaction that I may have the first bike trailer that has ever been seen at the supermarket. Almost everyone else arrives by car. Our Subaru can carry enough foodstuffs for a small army, but green guilt interferes, so I’m usually on foot. 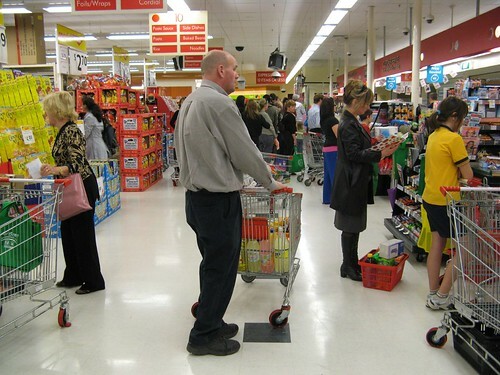 There are two stores that are pretty accessible from here– Safeway and Coles. I go to Coles. Not only is it closer to where I live, it is larger and has more variety. In addition, the building houses a Chemist, a greengrocer, a fishmonger, coffee merchant, butcher, specialty foods shop, Italian kiosk, etc. Not to mention a “bottle” shop. Coles has been in the news a lot lately since it has been “in play.” That seems to have finally been settled with the purchase of the company by a corporate entity called Wesfarmers. Safeway is owned by Woolworths (no relation to the US retailer). There is a discount war going on now between the two supermarket giants. I have no idea what that will mean to the price of milk at the checkout counter, but I suspect that in the long run, prices will go up. There are all those shareholders to satisfy and the drought shows no sign of ending anytime soon. It is easy to justify higher prices when farmers are going under due to lack of rain. When the first fleet landed on these shores, they brought their provisions with them. It was a good thing. The aboriginals had managed to sustain a substantial population on marginal land, but few of the new settlers showed any inclination to learn from them, or to eat what they ate. For years, Australian “cuisine” meant nothing more than a slightly modified English cuisine, and we all know how dismal that was. During a year I spent in London, I remember staring in astonishment at a jar of peas that had been boiled to such an extent that the peas were absolutely translucent. All the chlorophyll had settled at the bottom of the jar. I once watched in horror as a British workman slathered mayonnaise on two pieces of thick white bread to make himself a sandwich filled with nothing but greasy french fries. He was mainlining cholesterol. Then came the immigration boom after the war. Suddenly, Australians woke up to good coffee (thanks to the Italians). Then came ethnic restaurants. Waves of Greeks, Chinese, Indians, Germans, and Vietnamese triggered a sea change in cooking. 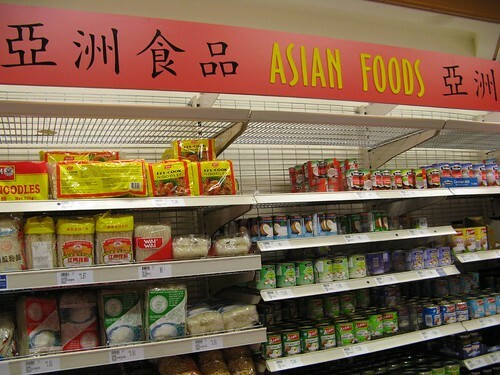 If you are partial to “ethnic” food, you will drool in an Australian supermarket. There are shelves devoted to all the Asian cuisines and European specialties, as well as local “tucker” like lamingtons, tim tams, pavlova, emu and kangaroo. Aside from wine, the biggest success as an export seems to be the lowly macadamia nut. Peanut butter is not popular but huge boxes of breakfast cereals tower over one entire aisle. Popcorn is only available in small packets; bulghur wheat impossible to find. Silverbeet(which I call Swiss chard) is astonishingly popular. Likewise pumpkin, which appears to apply to almost any squash, and “rocket” salad, which I would call Arugula. The seafood selection is limited. Flathead, salmon and a fish called the blue grenadier are popular. Judging from the amount of space given over to meat, seafood devotes would seem to be few and far between, but I’ve been told that locals buy their fish from fish vendors. I’m sure Kraft is screaming bloody murder. Just think of the lost opportunity for prison movie product placement, “star prisoner” endorsements. Ban Vegemite? What’s next?